Eddie Lanning, the titular character of Lot Boy, Greg Shemkovitz’s debut novel, is a slacker doing menial work at his father’s car dealership. He spends most of his time verbally brawling with the mechanics, shirking his responsibilities, and ranting against his lot in life. Another dealership reprobate, Spanky, convinces Eddie to step up his amateur stolen parts operation. Eddie desperately wants to escape his hometown and needs the money to leave, but his father’s cancer diagnosis complicates matters. The inexperienced criminals are naturally conned, and Eddie must decide whether to flee or face the would-be buyer’s muscle, to abandon his father or stay and inherit the dealership. Eddie is a crude fool on the surface (and several layers down), as are many of the novel’s characters. It’s a very subtle reveal, but beneath the antagonism and toilet humor the reader catches brief glimpses of the bonds between Eddie, his reviled coworkers, and his dying father. Sullen lot boys and greasy mechanics labor under Eddie’s father’s verbal abuse and out of an entire chorus of disgusting men, there are only two female characters. Edith, the dealership’s secretary, floats above the chaos and commands respect as the deliverer of pink slips. Hannah, the love interest, is a cynical, rehab group home resident. Lot Boy’s dearth of female characters raises interesting questions on gender and the role of female influence. The lack of a mother, for example, complicates Eddie’s relationship with his father, Pat, and gives Eddie a thin sort of raised-by-wolves excuse for his behavior. The descriptions of Buffalo, New York, the book’s setting, add a more relatable note to the story. Eddie frequently describes the snow, the salt corrosion and the weather, the city that traps him metaphorically the same way he is stranded in broken down trucks. Being stuck in a small town is a universal theme, as almost any teen or young adult with strained circumstances can attest. The book’s “About the Author” section notes that Shemkovitz himself left Buffalo, but Eddie’s fate is still up in the air. Small pockets of tenderness balance the harshness of the scenery—as well as the dialogue’s crudeness—creating a more nuanced story. Eddie reminisces about a nook behind two filing cabinets where he used to hide as a child, practicing script and doodling on the walls. Eddie remembers mistaking Edith, the only female in his early life, for his mother. He eventually scratches her name off the wall of his hiding place, a bittersweet amendment of his mistake. Pat swears that Eddie’s real mother, who died during childbirth, saw her son. “Maybe for a second but she saw you.” Eddie recognizes that this shouldn’t be important, but realizes that it is. It’s difficult not to detest these characters, but these small windows of likeability tip the scales just enough not to write them off as dirtbags. Lot Boy will likely appeal most to the younger male demographic, but any reader can appreciate the struggle against apathy, the limitations of a small town, and familial expectations. One starts the book with interest in Eddie’s crime, but ends up turning the pages for the relationships. 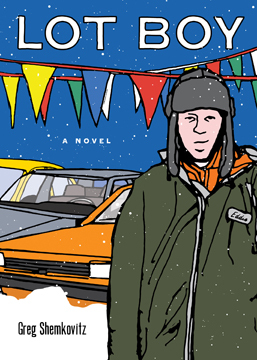 Vulgar and harsh as the novel often is, Eddie’s independence from and dependence on his dealership family are the heart of the story. L.L. Givens received her MA in children’s literature from Kansas State University in 2011. A member of the infamous PBR Book Club, she regularly reads and loudly critiques unusual, hipster, and/or pretentious novels. Givens works in STM publishing, but literature is her first love. You can find her on Twitter at @LLGivens.